For many companies, compressed air is seen as one of the most expensive utilities. An industrial air compressor can mount operations costs of more than $800,000 in electricity over ten years. What’s worse is that much of that electricity is wasted. A typical air compression system loses about half of its air to leaks, poor maintenance or inadequate system planning. There are many benefits of compressed air training. Manufacturing operations whose employees have gone through a compressed air training course have lower utility costs and more energy efficient compressed air use. Compressed air training also reduces workplace accidents from inappropriate air compressor use. Finally, compressed air training can lead to less costly repairs overall because minor problems are identified and fixed before they become major issues. To empower companies, the compressed air industry promotes The Compressed Air Challenge. The Compressed Air Challenge is a brand-neutral effort to improve the efficiency of compressed air systems by training facility managers, operators and maintenance technicians. It features webinars on compressed air systems, as well as some in-person trainings. If you’d like training on how to get the most out of your compressed air system, you don’t need to wait for the Compressed Air Challenge to offer a course near you. Quincy Compressor distributors can help you find ways to get more out of your compressed air system quickly. Companies that offer compressed air training to a variety of people — not just maintenance personnel — tend to get the most from these trainings. That’s because employees interact with a compressed air system in different ways. Offer compressed air training to tool operators, maintenance personnel, office staff and purchasing employees. In many cases, it’s possible to offer a short training to all employees to generate awareness about compressed air. A great example of how compressed air training can work comes from the New Afton Gold mine in Kamloops, British Columbia, Canada. Inspired by the Compressed Air Challenge, energy manager Andrew Cooper wanted to create awareness of compressed air and its costs. He started by offering a 30-minute training on compressed air to mine personnel. More than 300 employees have already been through the training. He offers this training to small groups of employees to give them the chance to ask questions. Offering awareness training to as wide an audience as possible is important, because energy efficiency and compressed air management is the responsibility of more than just one person. Since there are almost always a number of people who interact with a compressed air system, educating more people about energy efficiency can only improve overall efforts. A short training can generate awareness of compressed air systems and needs, but you’ll need more time to educate people about the complexity of compressed air systems and their maintenance needs. One idea is to organize a longer training for employees who perform different job functions. Mechanical and electrical maintenance and tool operators can particularly benefit from this in-depth type of training. Although these advanced sessions won’t be valuable for all job functions, it’s important to have more than one person trained in compressed air management. For example, the New Afton mine had 13 people attend the two-day training on Advanced Management of Compressed Air offered by the Compressed Air Challenge. According the Compressed Air & Gas Institute, about half of all compressed air that’s created is wasted. Artificial demands on the system, inappropriate uses, improperly sized applications and leaks in the compressor lines all create waste. Since compressed air is so expensive to generate, eliminating this waste can have a major impact on a business’ utility costs. One of the biggest reasons for compressed air waste is simply a lack of education. Because atmospheric air is so plentiful, many people assume compressed air is as well. This means employees generally use more compressed air than is needed. Air compressor systems that operate exclusively at high pressures tend to waste air and money. Unfortunately, many tool operators tend to operate compressed air systems toward the higher end of a recommended range. That means higher electricity costs, and it also increases the air lost through any leaks in the system. Tools also fail more quickly since they are not being properly used. High pressure air costs more to produce than low pressure air. A good rule of thumb is to assume that for every additional two psi of air pressure, you’ll see a one percent increase in operating costs. That means an air compressor that’s operating at 110 psi instead of 100 psi costs an additional five percent to operate. Unfortunately, identifying the proper psi needed for different projects isn’t always easy. One of the benefits of compressed air training is teaching employees how to determine this information. Compressed air training can also improve efficiency by teaching users what types of waste to identify and eliminate. In many factories, idle equipment and unused equipment stays connected to the compressed air system, meaning unused tools continue to use compressed air. Reducing this waste doesn’t take much effort. Operators who know what to look for can easily disconnect unused tools from the compressed air system. Employees who have been through compressed air training are also better equipped to identify other types of compressed air waste on the job. Installing nozzles on the compressed air system, knowing when to turn off or reduce the air pressure as well as other simple tasks are a cost-effective way to reduce compressed air waste. Inefficient schedules for compressed air systems can also result in wasted air consumption. It’s common for compressors to operate at high pressures or to be in operation when nobody needs them. This excess pressure causes increased demand on the system, driving up the cost of producing compressed air. Ten to fifteen percent of the cost of compressed air can usually be attributed to these system inefficiencies. Compressed air training can also help operators identify ways to improve their systems. It can sometimes be a matter of pressure evaluation and controlling the flow. Storage needs are also easier for internal personnel to evaluate on the fly when properly trained. Employees who are familiar with compressed air systems and their outputs are better equipped to make these decisions. Increased energy efficiency is another major benefit of compressed air training. The cost of electricity makes up approximately 76 percent of the cost associated with compressed air systems. For this reason, improving energy efficiency can have a big impact on a company’s bottom line. In general, investing in an energy efficiency project for your compressed air system can reduce current cost of compressed air by 20 to 30 percent, on average. The majority of these savings come from reduced electricity use and less wasted air. New Gold, a Canadian mining company, recently began offering compressed air trainings for its employees. The company’s New Afton mine spends roughly $400,000 per year on compressed air. The potential savings for this mine were approximately $80,000 to $120,000 per year, according to New Gold. To date, nearly 300 employees have been through the first stage of the compressed air training program. Because compressed air is easily available in a work site, it tends to be used for a variety of purposes, but some of these tasks are better suited to other tools. Using compressed air for these tasks is inefficient, and importantly, it can be dangerous. In some cases, using compressed air is the most effective choice. For instance, compressed air is a good choice when shorter drying time is crucial. It’s also a good choice when process cooling needs to happen quickly. Compressed air training can help employees identify these situations and remove inappropriate uses. To operate at optimum efficiency, compressed air systems require regular maintenance. Even the most energy efficient systems will be less effective if they receive only the minimum amount of attention needed to keep the system functioning. How much of a difference does maintenance make? An optimized system that receives regular preventative maintenance usually has energy improvements of 20 to 50 percent, compared to a system that receives minimal maintenance. For a 100 horsepower system that operates continuously, this translates into a savings of $7,000 to $18,000 per year. While it’s not as likely for a well maintained compressor system to break altogether, overlooked issues may have faulty maintenance to blame. Instead, many of these maintenance needs show up in small ways. You may notice the system’s pressure drops by two to three psi or that the water temperature in the heat exchanger is slightly higher than normal. You may also simply notice a slight hissing sound when the compressor is idle. All of these can be signs an air compressor system needs maintenance. When employees have compressed air training, they’re more likely to identify these issues early. This means maintenance can get done faster, and your compressed air system will operate more efficiently. Modern compressed air systems are significantly more energy efficient than earlier models. Developments like variable speed drives, improved storage capacities and energy efficient controls all make newer systems more energy efficient. Still, for the majority of air systems in operation, there are many ways to improve the energy efficiency. In fact, there are low-cost opportunities to improve efficiency for about half of all compressed air systems in use. For instance, the humidity and temperature of the air entering the compressor can influence the energy needed by the compressor. Colder air with low humidity is significantly easier to compress than warmer, more humid air. Cooling air before it enters the compressor, or simply changing the location of the intake valve, can make a big difference — and employees with compressed air training can help you identify these opportunities. Some employees are not as careful with compressed air as they should be. 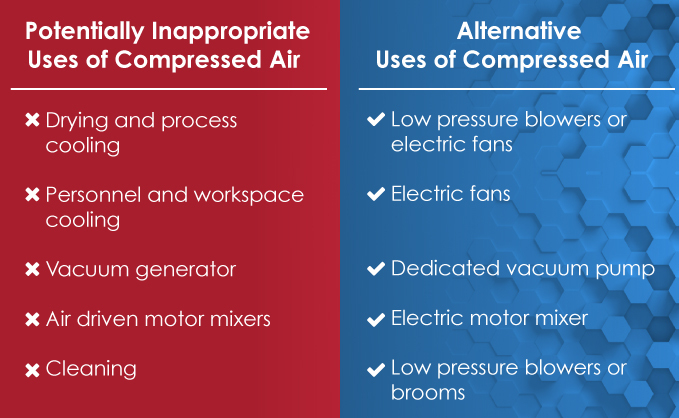 Because compressed air isn’t directly connected to electrical systems, many employees don’t take the same level of care while working with it. How often do employees wear personal protective equipment around the air compressor? Compressed air also gets used for a wide range of tasks. From cleaning to drying paint, compressed air can make a job faster, but that doesn’t mean it’s always safer. Using compressed air to clean a work area — or even clothes — can result in serious injuries. Workplace injuries like those caused by misused compressed air can have a serious impact on a business’ bottom line, too. It’s estimated that workplace injuries cost society about $128 billion each year. That’s equivalent to 25 cents from every dollar of pre-tax profits. An air compressor often produces at least 120 decibels. That’s equivalent to a plane taking off, an oxygen torch or a chainsaw. Regular exposure to these volumes is often painful, which results in lower employee productivity. Regular exposure to these levels of noise can also cause hearing loss. That’s why ear protection is recommended for regular exposure to noises that are more than 85 decibels. It only takes 40 psi of air pressure to propel particles with the same force as shrapnel. When compressed air is used to clean debris, the pressure of a compressed air system can turn typical dust and debris into a workplace hazard. Employees who aren’t wearing eye protection are at particularly high risk of injury. The pressure of compressed air itself can be a danger when it’s used the wrong way. Because it’s convenient, many employees use compressed air for a wide variety of tasks. When it’s used to clean clothes or hands, the pressure of the compressed air can cause lacerations to the skin. Eyes and ears are particularly susceptible to this type of damage. Though rare, compressed air can also penetrate the skin, causing an air embolism. These embolisms are extremely dangerous and require immediate medical attention. If a hose is improperly attached to an air compressor, it can break loose and cause injuries and damage. The thrashing hose and any tools attached become dangerous projectiles. This can happen if the hose itself ruptures or if the couplings that attach the hose to the compressor release suddenly. Luckily, compressed air training can reduce or even eliminate these risks. Compressed air training can improve workplace safety, improve employee morale and lower the number of accidents that occur on the job. A recent poll by Liberty Mutual insurance showed that for every $1 an employer spends on safety training programs, approximately $3 are saved. Workers who receive safety training about how to handle and operate a compressed air system are less likely to get injured on the job. That means lower workers compensation costs and a more productive workplace. We think people should have access to all of the information about their compressed air system. That’s why we publish an extensive list of resources on our website. Whether you’re just getting started with compressed air systems or are looking for up-to-date technical information, our knowledge center has resources for you. If you’re new to using a compressed air system, we recommend starting with our compressed air basics. We also provide a wide range of tools to help you optimize your system. We know that no online resources can replace the knowledge and experience a trained technician offers. That’s why at Quincy Compressor, we offer more than equipment. We want to help you get the most out of your compressed air system. All of our service representatives have the experience and expertise to help you. Along with comprehensive service, we’ll help you troubleshoot your equipment and offer tips to help you get the most out of your compressed air system. If you’re looking for an in-person training, Quincy Compressor can help you find one. Finding a Quincy Compressor authorized distributor is easy. You can search for a local sales and service representative or contact us today!